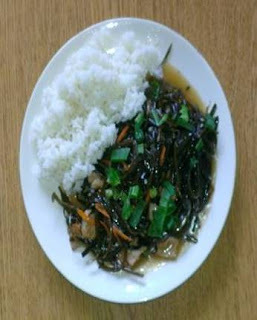 A popular and nutritious special! Mountain Palace Restaurant will no longer be open on Sundays effective July 15. We will maintain our usual Friday and Saturday hours. Lacy's website is now operational. 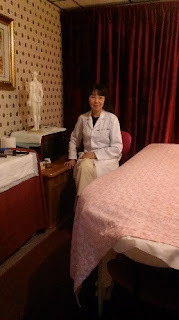 Everything you wanted to know about her acupressure treatments, background including resume, the creation of Mountain Palace, etc. One of our most nutritious specials is available this weekend. Try this uniquely tasty and most healthy item. Mountain Palace will be closing on Sundays beginning July 15. Due to the heavy schedule of acupressure treatments throughout the week and weekend mornings, Lacy has decided to curtail Sunday restaurant hours. Mountain Palace will continue to be open Friday evenings from 5 to 9 and Saturdays from 12 to 9. We apologize for the inconvenience. One of our most popular specials. 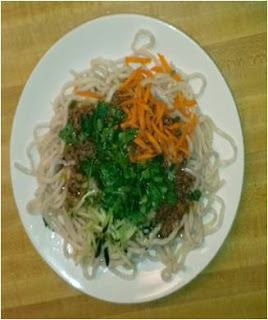 Lomein noodles with ground beef and tasty tomato sauce with shredded cucumber and cilantro if you like.